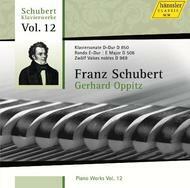 The final release in the series of the Schubert Cycle with Gerhard Oppitz - enthralling interpretations as usual. Gerhard Oppitz's understanding of the musical depth of Schubert's creations is without peer, all the more effective for its unobtrusive understatement. The 'heavenly lengths' of this composer are a challenge for some artists, who transform transcendence into tedium, but not Gerhard Oppitz. Under his hands, he is able to draw out the narrative logic of each large-scale Sonata while engaging the smaller pieces for what they are: jewels of pianistic invention.